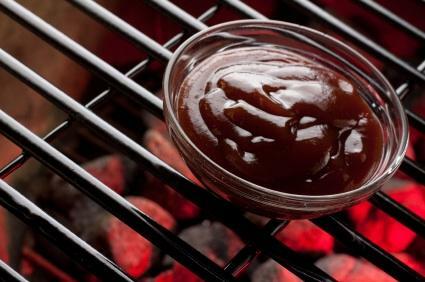 Homemade barbecue sauce is one of the best treats you can offer your friends and family. While bottled versions are quick and easy, a slowly simmered homemade sauce takes flavors and richness to a whole new level. When searching for a recipe know that there are hundreds of different recipes and dozens of different styles of barbecue sauce. In the United States there are at least 12 different well-known regional styles, but each of these has countless variations. Every barbecue cook can customize a sauce to fit their specific tastes and needs. Here is a brief rundown of some classic American regional barbecue sauces you can create at home. This style is one of the most popular styles of barbecue sauce in the US. It is tomato-based with a sweet-tart flavor that is usually sweetened with brown sugar or molasses and balanced with vinegar. This type of sauce isn't meant to marinate the meat, but instead provides a beautiful coating that caramelizes to form a crust. Combine all ingredients, except for the butter, in a saucepan and bring to a simmer. Cook on low heat for about 25-30 minutes stirring every 8 minutes. Add butter and stir until combined. The Carolinas boast more regional sauces than anywhere else in the United States, and the only "cue" you will find here is pork, usually a whole hog that is cooked very low and very slowly and then pulled into juicy pieces that are mixed with the sauce and served on a plate or a bun.A mustard sauce is excellent with pork because the sharp flavors cut through the rich fat of the meat. These sauces are essentially a mix of yellow mustard, vinegar, sugar and spices. Some are sweetened with sugar, and some are more tart. When making your homemade barbecue sauce decide which style suits your taste best. Place all ingredients into a saucepan and heat to a low simmer. Remove from heat and cool. The citizens of the Western Carolina region like a peppery mop sauce. This version is made with tomato sauce or ketchup. Combine all ingredients in a saucepan and bring to a low simmer. Cook until the sugar dissolves and the ingredients are well blended. Spoon the final sauce over barbecued meats or chicken. Texas-style barbecue sauce is typically reserved for beef brisket. This sauce is traditionally thin and flavored with vinegar, chili powder, black pepper, cumin, hot sauce, onions and a bit of ketchup. It is often brushed over the brisket as it cooks. Combine all ingredients in a saucepan and simmer over low heat for about 10 minutes. Remove from heat and cool, then baste over beef brisket as it cooks. Serve reserved sauce on the side to mop up with the meat. Whiskey is a Tennessee staple, so it is only fitting that locals include it in their local sauce. Whiskey provides a little smokey tang and this sauce is perfect for just about any type of barbecued meat. Slather it on just before the meat is finished cooking. Heat the oil in a large saucepan and add the garlic and onions. Cook, stirring frequently, until onions are soft. Stir in the mustard, chili powder, paprika and cayenne. Cook for another minute and stir to coat the onions with the spices. Add the rest of the ingredients and stir till blended. Bring to a medium boil and then reduce to a simmer. Cook the sauce for about 25 minutes or until it has thickened. Add the water, if needed, to make the sauce of pourable consistency. Add salt, pepper and Tobasco to taste. Memphis Tennessee is renowned for its barbecue. The locals focus on ribs and pulled pork, which are coated with a distinctive spice rub that is based on paprika and a variety of other spices such as black pepper, chili powder and oregano. Combine all ingredients in a bowl and mix until well combined. Now that you have an idea of the different styles of barbecue sauce, you will need to do some research into the traditional styles of barbecuing the meat. Every one of these sauces goes with a specific style of meat cooking. However each sauce will be just as good on a steak or a piece of grilled chicken as they will in the traditional manner that they are usually served. Have fun and experiment with the flavors and techniques!